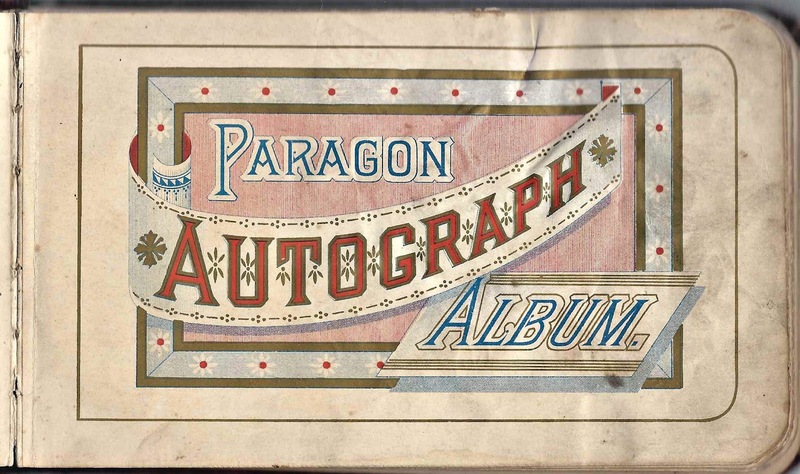 1880s autograph album of Maggie Erny of Pittsburgh, Pennsylvania. Maggie or someone else wrote her name on the first end paper. She kept the album before and after her marriage to Frank Lever [Leever] in 1886. On the inside front cover, a descendant identified Maggie as her grandmother. The album is approximately 7" x 4-1/2" and has puffy velour covers. It contains over 30 pages signed by Maggie herself, her relatives and friends. Some people signed multiple pages. An alphabetical list of the signers appears at the end of this post. Margarethe "Maggie" Erny was born about October 1863, the daughter of Frank Anton Erny and Elizabeth (Heisel) Erny, who were born in Strassbourg [then Germany] and Pittsburgh, Pennsylvania, respectively. Maggie's paternal grandparents were Michael and Katherine Kertzinger. Her maternal grandparents were Jacob and Anna (Speicher) Heisel. 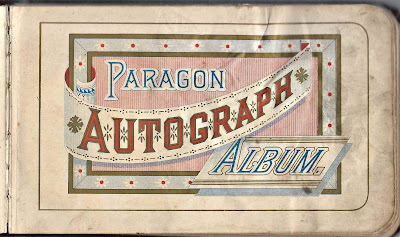 At least two of Maggie's siblings signed pages in her album. Stella Erny signed two pages on 30 August 1891. 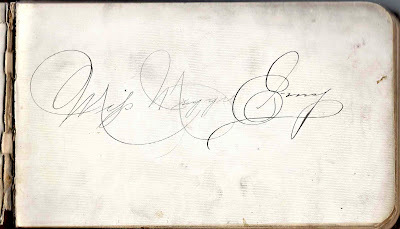 Maggie's brother F. Enry signed a page in 1891. Maggie had two named Frank, but this was likely the one whose first name was Frank, the sibling born just before Maggie. Another signer called Maggie a sister, but I don't know if Ollie, who signed at Findlay, Ohio, on 29 December 1887, was a sister, a sister-in-law or a sister in faith. Maggie had a sister named Molly, and it's possible Ollie was a nickname for Molly. 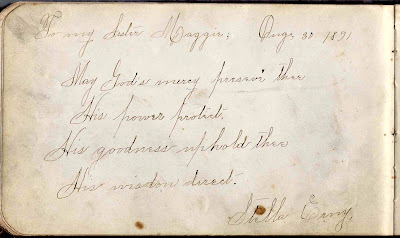 On 8 July 1886 in Allegheny County, Pennsylvania, Maggie married Frank Lever, son of Daniel and Susannah (Frase) Lever. I found the name spelled variously as Lever, Leever and Levers. Frank was born about October 1856 in Ohio. 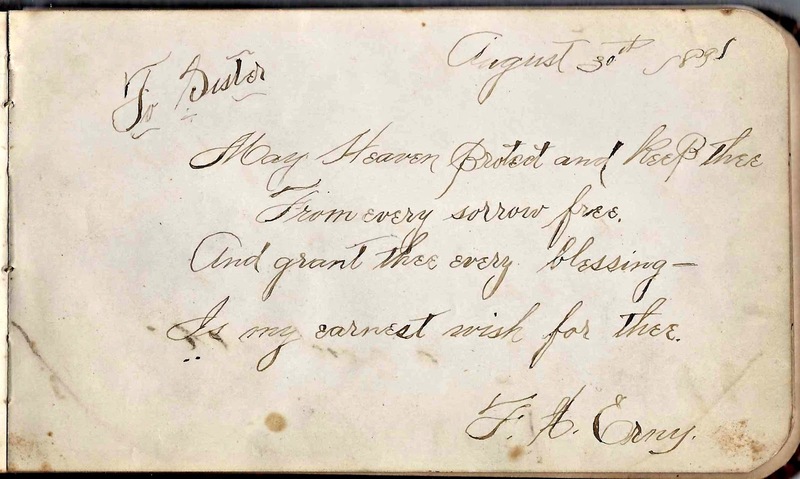 Perhaps the Frank L. of Pittsburgh, Pennsylvania, who signed the page below on 10 July 1884 was Frank Lever. With the benefit of hindsight, his message is amusing. Maggie and Frank had at least eight children: Joseph; Frank; Carrie; Xavier; Aultina; Gertrude; Edward; Marcella Mary; and William Joseph Dekoth Lever. 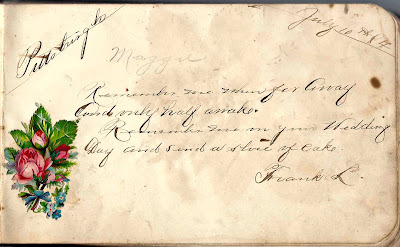 Two of them signed pages in Maggie's album. 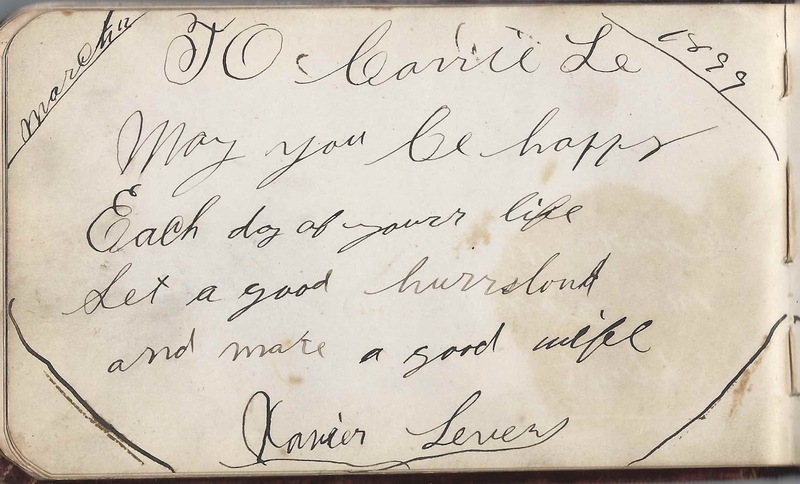 Xavier Lever signed a page on 12 March 1899. 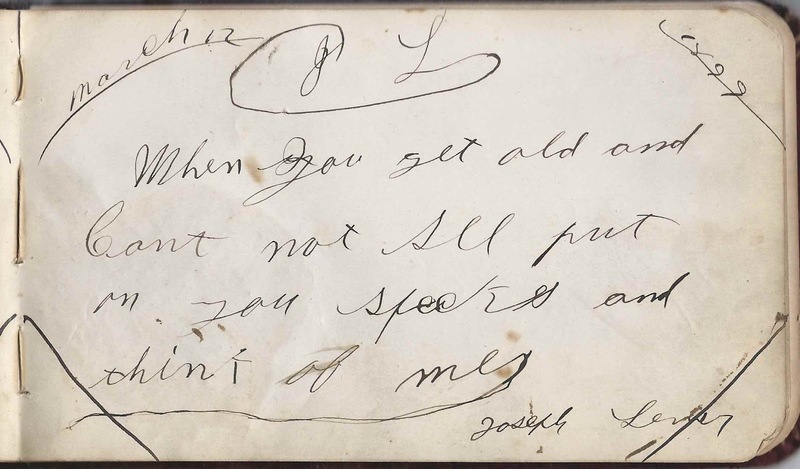 Joseph Lever signed the facing page on 12 March 1899. 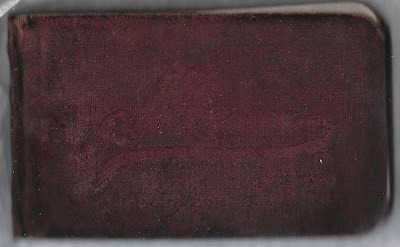 Many of the pages have Victorian scraps pasted on them. 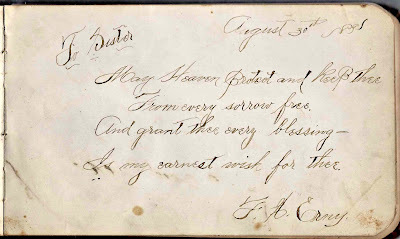 One of the nicest scraps was on a page signed by Fannie Glasgow on 30 October 1888. 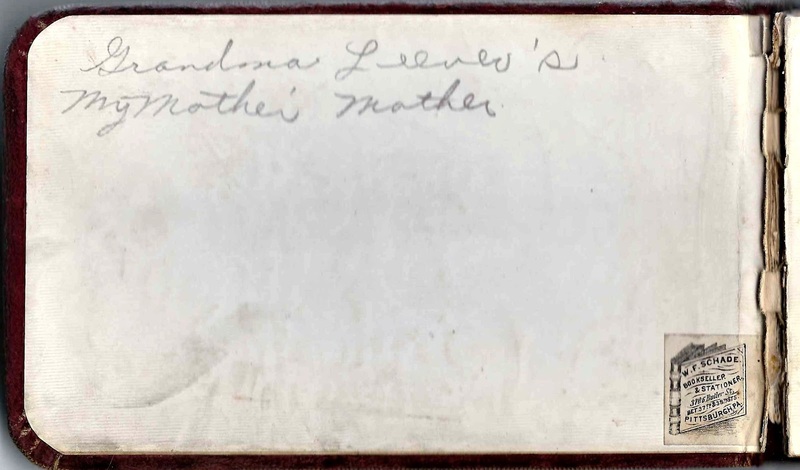 Fannie signed the facing page as well and addressed her page to "Mrs. Leaver". If you have corrections to the information above, or information on any of the signers, please leave a comment or contact me directly. Thanks! Alphabetical list of signers: [Note: given names within a specific surname may not be in alphabetical order. 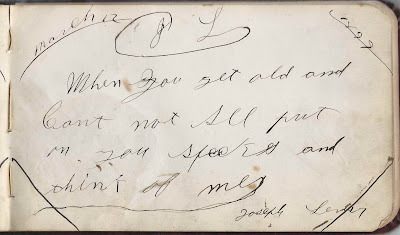 "Sister Ollie", signed at Findlay, Ohio, on 29 December 1887. I don't know if this was a real sister [Mollie], a sister in law or a sister in faith. Miss Maggie Erny; album owner. Margarethe "Maggie" Erny. 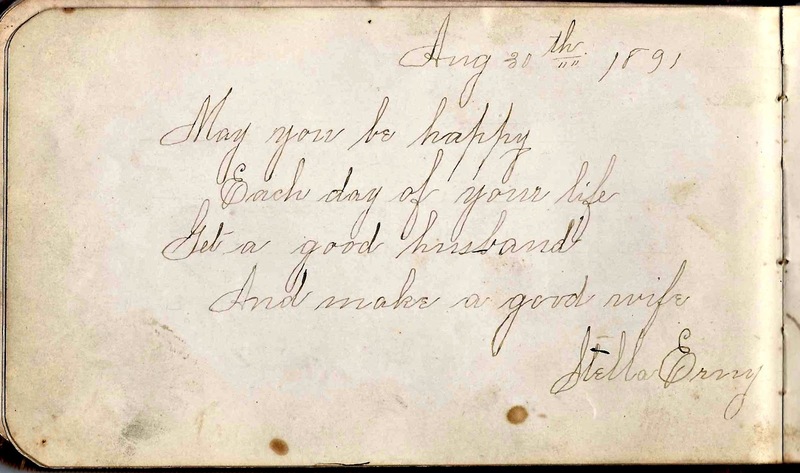 Stella Erny, signed on 30 August 1891; Maggie's sister Hestella "Stella" Erny. She signed another page as well. 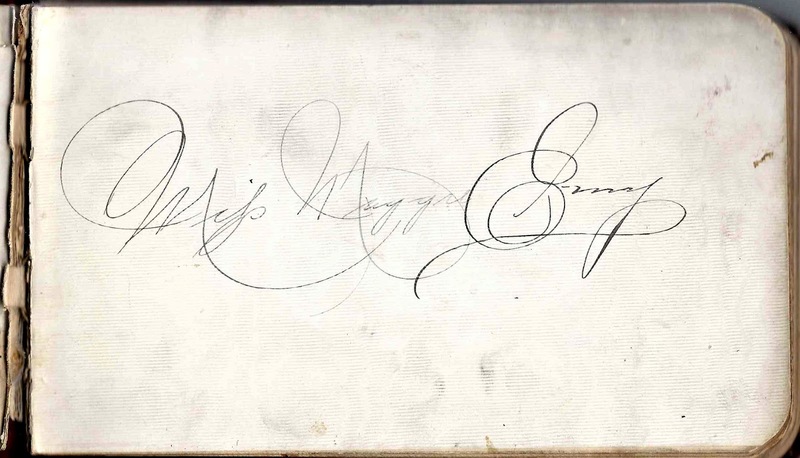 F. Erny, signed on 30 August 1891; Maggie's brother. I can't make out his middle initial. James S. Giles. 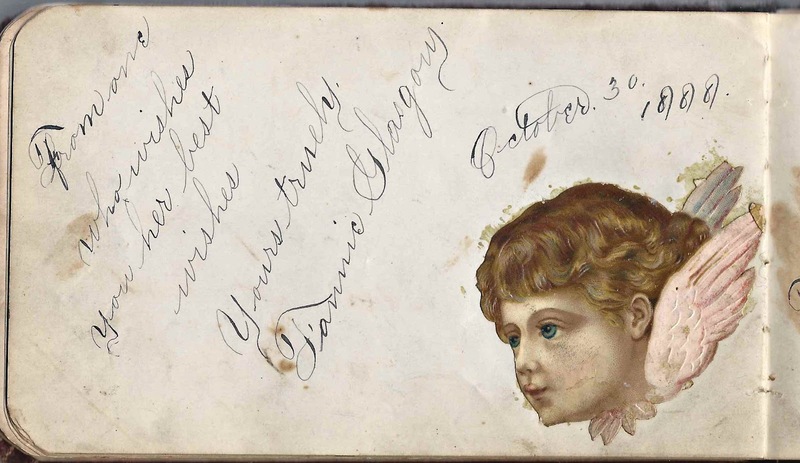 The page appears to have been signed first on 12 January 1885 in blue pen. 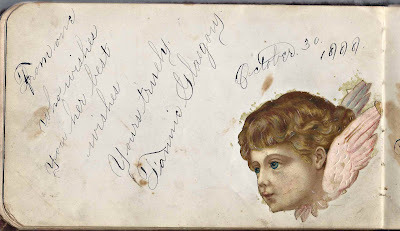 Later in black pen, James added "Pittsburgh, Pa"; "To Maggie"; "October 30th"
Fannie Glasgow, signed on 30 October 1888. She signed the facing page as well. "Mrs. Lizzie Henckleberg, 5424 Natrone Alley, Pittsburgh Pa". 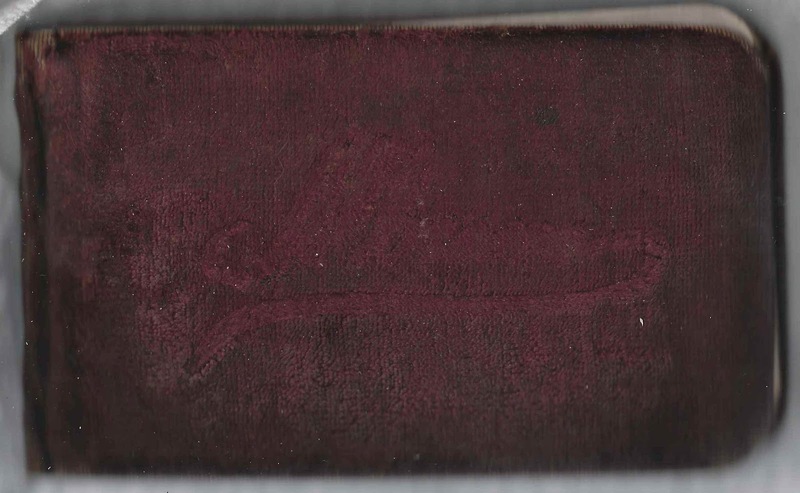 One of two names and addresses written on one of the first pages in the album. The other was Mrs. James Swift. 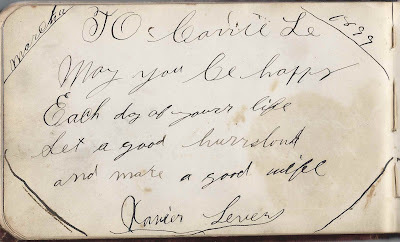 Xavier Lever, signed 12 March 1899. 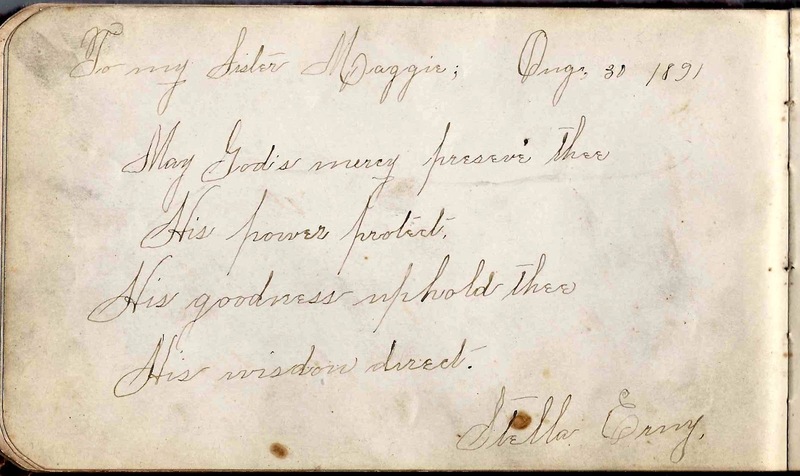 I believe this page was signed by Maggie's son Xavier Lever and inscribed to his older sister Carrie Lever. 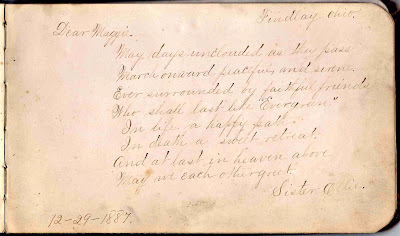 Maggie Miller, signed on 23 January 1891, inscribed to "Mrs. Leaver"
Mrs. A. Miller, signed on 23 January 1891 and inscribed to "Mrs. Leaver"
Mary Mungavan, signed at Pittsburgh S.S. on 1 October 1885, "Sunday Evening"
Mary Mungavan, signed at Pittsburgh, Pennsylvania, on 27 January 1885, on "Thursday Evening"
Fannie Swift; she inscribed a message on the facing page as well. Yes, I've contacted you privately with the details.